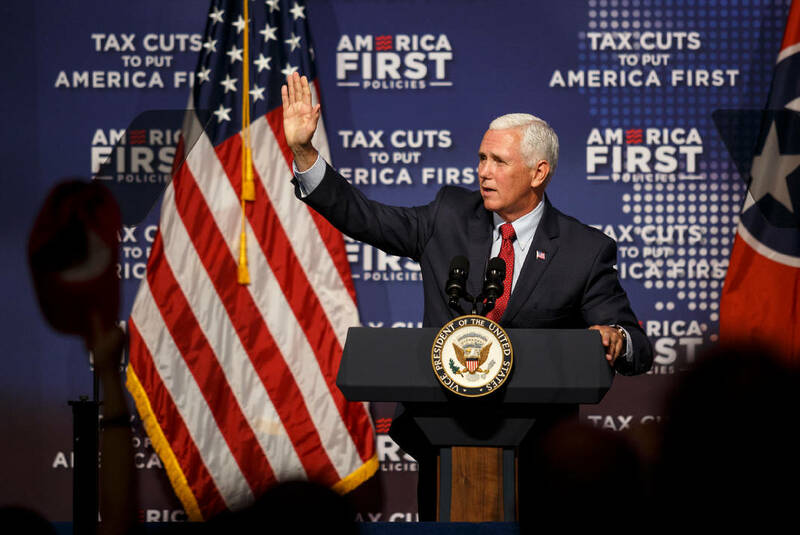 Vice President Mike Pence speaks at a tax policy event hosted by America First Policies at Lee University's Pangle Hall on Saturday, July 21, 2018, in Cleveland, Tenn. Vice President Pence was the keynote speaker at the event, which featured a panel of guests discussing the effects of President Donald Trump's tax bill. Vice President Mike Pence visited the Chattanooga area Saturday to tout President Donald Trump's tax policies before attending political events for two Republicans in tight races in the Southeast. The former Indiana governor called the 2017 tax cuts the biggest in a generation and a generator of American jobs in front of a raucous crowd. His wide-ranging, 33-minute speech at Lee University addressed immigration, the economy, Supreme Court nominations, environmental rollbacks and chastised the "liberal left" before narrowing his message to tax cuts. "We cut taxes for working families" Pence said. "We think the average working family in Tennessee will save about $2,000. We cut taxes for businesses large and small so businesses here in Tennessee can compete and win against businesses anywhere in the world." U.S. Reps. Diane Black and Marsha Blackburn, who are both in tight statewide races, joined the vice president on stage to compliment the work done by Trump's administration. The vice president spoke highly of both candidates before turning his attention to Trump's recent European trip. Pence called the trip a "success," despite the president being criticized by members of his own party for backing Russian leader Vladimir Putin over the U.S. intelligence community in regard to Russia's alleged meddling in the 2016 election. Later Saturday afternoon, Pence flew to Macon, Georgia, to headline a rally in support of Secretary of State Brian Kemp's campaign to succeed Gov. Nathan Deal. Pence's stops in Tennessee and Georgia were part of the "Tax Cuts to Put America First" series hosted by America First Policies. The Chattanooga stop was the 19th in the traveling series. A petition signed by more than 500 people unsuccessfully attempted to keep Pence from visiting the Church of God-owned Lee University. About 50 protestors gathered more than two hours before the event across the street in a grassy area outside the university's communications building. Several Lee students joined community members to protest the visit. "Whether you're meaning to or not, by allowing Pence to speak, you are aligning the name of Christ with the Trump administration, with Mike Pence, with Make America First policies, and we honestly think that a lot of the policies don't represent Christ," Lee University student Hunter White said. Other students and alumni disagreed, instead choosing to welcome the vice president. "I think it's a big day for the community," 2015 graduate Josiah Augustine said " It's definitely a historic day. I do support free speech, and I think that a place like Lee University should be an open place for both parties." Hundreds of eager guests lined Church Street through the south end of the university's campus Saturday morning, waiting to enter Pangle Hall. Children in "Make America Great Again" memorabilia, NRA hats and Trump socks anxiously waited with their families to enter the repurposed sanctuary, with guests arriving as early as 5:45 a.m. for the 11:15 a.m. event. The free, ticketed event was first-come, first-serve, with 300 overflow seats available in an adjacent building to the 731-seat hall. Cleveland Mayor Tom Rowland was in the audience and addressed the visit. "It is an awesome occasion," he said. "We are certainly delighted to welcome the vice president. There are people here who are naysayers. They have their place to say what they want to say, but as far as the city of Cleveland, he is most welcome to come. It is an honor that he is here today." Republican lawmakers Chuck Fleischmann and Scott DesJarlais joined local business owner Dan LeVan of ENERG3 for a discussion about the tax plan prior to Pence's appearance. Pence was then introduced by Blackburn, who told the crowd they "would not find a more principled, better man." Pence returned the favor, urging voters to vote for the congresswoman over her opponent, former Tennessee Gov. Phil Bredesen. However, despite the Trump administration's endorsement of his opponent, Bredesen is hopeful the Cleveland, Tennessee, crowd isn't representative of the majority of the state's voters. "Governor Bredesen's message of working together to get things done is resonating with voters throughout the state who are tired of the hyper-partisan yelling and finger-pointing," reads a Saturday statement from his campaign. Pence joined Blackburn for a private political event later in the afternoon before traveling to Georgia to support Brian Kemp's gubernatorial run. Kemp and Cagle are both seeking to stake out conservative positions on the coattails of Trump, each frequently evoking the president's name in television ads, in stump speeches and in debates. "It's always good to be back in Cleveland. This is our third time during this election cycle & I know we'll be back soon. Especially with the great advertising on the sign! Proud to be supported by the Sheriff, Commission Chair, and Senator," Cagle tweeted.